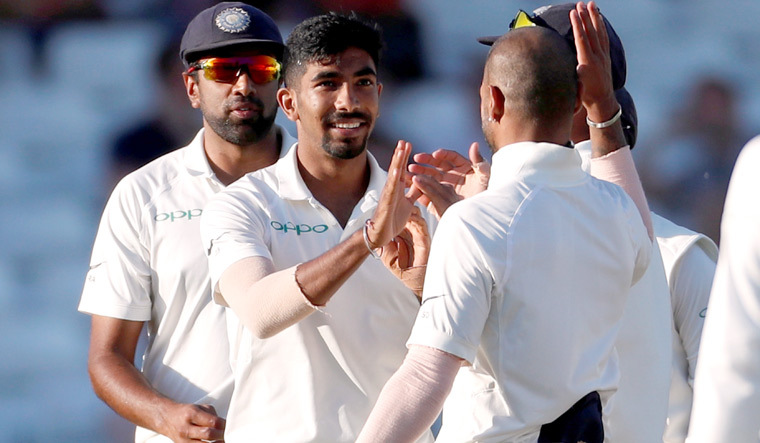 Jasprit Bumrah produced a hostile spell of fast bowling to put India on brink of a comprehensive victory before the final England pair delayed the inevitable on an engrossing fourth day of the third Test. Coming back from injury, Bumrah (5/85 in 29 overs) wreaked havoc with the second new ball after stiff resistance from Jos Buttler and Ben Stokes as England barely survived at 311 for 9 in pursuit of an improbable target of 521 runs. This was Burmrah second five-wicket haul in only fourth Test match. England will need another 210 runs on the final day which is impossible as the question is when would India take the final wicket on the fifth day to pull one back in the series. The last pair of Adil Rashid (30 batting) and Jimmy Anderson (8) played nearly six overs and will pray that fickle English weather come to their rescue. Flamboyant strokeplayers Buttler (106) and Stokes (62) curbed their natural instinct to added 169 runs in 57.2 overs in a show of grit and application. It was a tough period for the Indian bowlers as the two players were ready to grind it out. Buttler playing 176 balls with 21 boundaries but more importantly Stokes, who consumed 187 deliveries, hitting only six fours. While India were never in trouble but the period once again defined the beauty of Test cricket where it was once again proved why patience is the most important virtue for top teams. However things changed dramatically after skipper Virat Kohli took the second new ball and Bumrah got Buttler and Jonny Bairstow (0) off successive deliveries. Buttler shouldered arms to an angular delivery expecting to go over stumps but it cut back sharply to hit the knee roll and was adjudged leg-before. Bairstow, coming out to bat with a finger fracture also expected an incoming delivery but it straightened after pitching to knock back the off-stump. Hardik Pandya (1/22) having a dream Test match then removed the stodgy Stokes who was squared up as KL Rahul took his third catch of the innings. Bumrah's penchant for bowling 'no-balls' then prevented him from completing his five-wicket haul after Adil Rashid was caught by Kohli in the slip cordon. The TV replays showed that Bumrah had overstepped. However he completing the well deserved milestone when Stuart Broad (20) edged one to Rahul for his fourth catch. Starting from overnight 23 for no loss, the English openers didn't stay for long, as they had no answer to Ishant's probing line and length. Keaton Jennings (13) was out off the fifth ball of the day, caught behind. Ishant then made it two in seven balls as he also accounted for former skipper Alastair Cook (17), caught by KL Rahul at second slip. From 32-2, Joe Root (13) and Olliver Pope (16) put on 30 runs for the third wicket. England crossed 50 in the 19th over. However the duo were never really comfortable at the crease. Root was having trouble comprehending Bumrah's angular delivery while Pope was playing flashy drives at every possible opportunity. It led to their eventual downfall, and they departed within five balls over the 25th and 26th overs. Root was first to go, just hanging his bat out to a wide delivery as Rahul caught another one at second slip. Then, Pope was out caught off Shami, with Virat Kohli leaping in front of Rahul to finish a fabulous diving catch. Things could have been worse for England with young Pant dropping Jos Buttler on 1 off Bumrah in the 27th over. Thereafter, Buttler tightened up and along with Stokes as India were made to wait till late afternoon when Bumrah got into the act with second new ball.